Eric Clapton... LEGEND!!! Wonderful tonight brings back happy memories many many years ago, when it was the main 'slow song' played at night clubs and everybody smooched to that song.... as for the song Layla... what can I say.... my female Kerry Blue who is now 8 was given the name Layla after my love of Clapton's music down through the years..... long may his music continue.. !!! I bow to you Mr. Eric Clapton! This song must be close to the best ever song I have heard. It describes the truth about what a man really does feel for his woman something that feels close to heart to me. Its beautifully written from vibes to lyric and has that ability to wash over you no matter how many times you listen. A song by a Legend that will never be forgot. 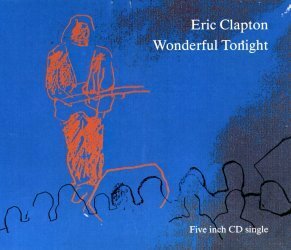 Wonderful Tonight is perhaps the best "slow song" of all time it tells the tale of undivided love and shows Eric Clapton's softer side which always peaks through in his music. You can tell that he is a lot shyer then other guitarists and that's evident in his song writing as well as his guitar work. He almost always has backing vocals usually over-lapping his own and he seems to actually care about the audience that he's playing for. These are just a few reasons why Eric Clapton has lasted so long. When you care for people they in turn care for you and you develop a certain loyalty. Eric Clapton will always have MY loyalty because I know he deserves it. Many say "Layla" is EC's greatest song, but no song ever recorded can come close to this classic ballad. I sing along with it every time I hear it, which must be in the hundreds since it was released. I have almost every album, box set, video and compilation EC has ever put out, but if I had to throw it all out except one single, it would be Wonderful Tonight. EC...you are indeed GOD! Wonderful Tonight is one of the worlds best known and best loved ballads. It has appeared in countless compilations, TV shows and films. The song seems to improve each time he revamps it. This version is a bit slower than the original and contains a wonderful, delicate solo. EC sings and plays this version better than ever. The single also has a live version of 'Cocaine' which is more lively than the original. This also has some great lead work and the great rhythm, the crowed are really up for this song too. A great single, with great extras.